I’m pretty obsessed with painting my nails. I have a big stash at home. Far too many shades that could be deemed the same colour. But they aren’t. You can never have enough reds for example. I’ve always wanted to migrate over to Essie polishes, being a bit of a die-hard OPI fan, so when they finally became available in Boots, I made sure I snapped a couple up. One of which was Penny Talk. Penny Talk is a beaut. It is the perfect rose gold that has a foil effect that is simply gorgeous – particularly with a tan. It’s similar to Orly’s Rage, except Rage is packed with finely milled glitter. 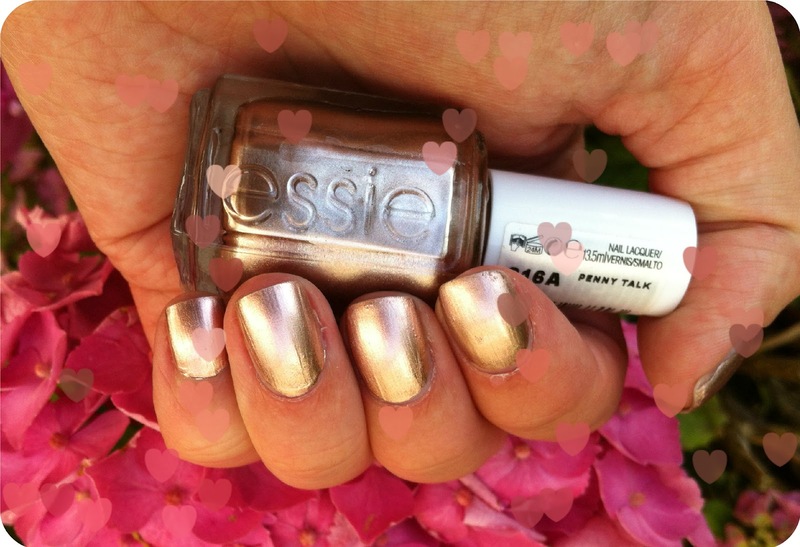 I think I’m more in favour of Penny Talk as it’s a little more demure – as demure as a rose gold, metallic polish can get! It’s one of those shades that you put on and then stare at your hands or tootsies constantly afterwards. I have it on both at the moment as I’m feeling matchy-matchy and I keep plumping for my River Island peep-toe platforms just so I can watch my toes gleam. You only need one coat of Penny Talk to be happy with it, which is fab with a newborn let me tell you that. However, when he’s asleep I like to do base coat, two coats of the polish and a topcoat, just out of habit and obsession with perfection. The staying power of this shade is decent. It doesn’t chip until around day three/four but it can scuff slightly on the tips, but I think that’s the nature of a foil effect polish. I love it anyway. You can buy Penny Talk, along with others in the selected Boots range for £7.99 here. If you have a Boots that stocks Essie near you, I would seriously go in and snap this up! Any Essie suggestions for me? I’m converted. I'm in love with the blogger's fave, the mint candy apple one. Such a lovely summery colour and only a couple of coats needed.